A long, long time ago, before man began to measure the passage of time, Kal lived in a small cave by the side of a lake. Kal was old, he had survived fourteen summers of his life, and that made him one of the strongest amongst his tribe. In these days, when the sky was still red for most of the day and the sun was larger than it is today, Kal would spend most of his days hunting on the great veldt for food to bring back to his people. Most of the males in the tribe who were not too young or too old would join him, but Kal was by far the strongest amongst them, for he could wrestle any of the thickly-haired gazelles to the ground without hurting himself. And when the sharp-toothed creatures that stalked in the night came to the caves to feed, Kal would fight them off with his sharpened sticks and cutting stones. Kal wore the skin of one of the night creatures to conceal his nakedness, and lined the floor of his caves with other pelts to keep him warm at night. It was the day after the old one had died. Kal had no language, and did not have a name for the word ‘father’, but he did understand that the old one was important to him in some strange and indistinct way, and had done his best to ensure that this old one was fed before the other elders of the tribe. The old one had perished slowly, having been bitten by a creature that would one day be recognised as a snake, but its teeth had been sharp and edged with a poison that had steadily infected the old one until his ankle had swollen and left him unable to walk. Kal had seen others die before, falling to the teeth of those that stalked the night, but he found himself uncertain what to do now that the old one had died. The sun was dipping low in the sky when Kal decided what he should do for the old one. Taking great care, Kal gathered one of the skins of a night creature that he had slain from the floor of his cave, and wrapped it around the old one’s body. Then, carefully, he lifted the body and walked down from the hillside towards the lake. The lake sat at the foot of the hill, with a small trail of shale stones that lead down to it from the caves. Kal stepped cautiously, knowing that if he hurried too quickly the stones of the trail to the lake would cut his bare feet. The lake itself was a thing of curiosity to the tribe, for it was the source of the water that they drank each day. There was no other water for many days walk, and so the tribe had lived here by this lake for years beyond memory. Kal kneeled down next to the lakeside, and placed the old one’s body beside the water. Looking out into the lake, Kal watched as its surface shimmered slightly in the red sunlight, the waters looking to be a hot orange-red hue. At times, the water seemed to sway and move slightly, almost as if on its own volition. Kal was more curious about the water than many of the tribe. There were many of the women folk who would not approach the lake, concerned with the way its colour would change, growing from a sombre orange to shimmering silver during the times when the sun was at its highest in the sky or into a dark blackness when the night crept out. Kal knew that small creatures would move through the water, little silver things with large eyes which one day his descendants would learn to catch, but that day was far away. All Kal understood was that when he grew thirsty, he came to the lake and drank its waters, and because he had to do this several times on each day he had the sense that the lake was somehow important. Crouching on his haunches, Kal removed the pelt that wrapped the old one’s body and slung it over his shoulder. He looked at the old one’s body once more, in the orange-red light of the setting sun. The lake seemed indifferent to the old one, its ripples licking softly at its shore. Kal stood and walked back to his cave. The next morning rose and the tribe gradually awakened. The things that stalked the night had not tried to feed whilst they had slept, but Kal and the other strong hunters of the tribe always slept with their sharp stones or sticks close at hand. Gradually they chewed on the remaining berries that they had scavenged the day before, and emerged from their caverns into the dawning sunlight. As with each morning, the tribe took their exodus down the little shale-marked trail to the side of the lake to quench their nightly thirst. They sat and crouched and leaned on the lakeside, cupping their hands into the waters and holding handfuls to their mouths, drinking eagerly, but none of the tribe would venture to swim in the waters. Not even Kal, whose lithe body was strong enough to surely keep afloat, would dare to try, for none of them could guess how deep the lake was. As he crouched by the lakeside, drinking in heavy gulps, Kal looked out into the lake and watched the soft ripples from far out on the lake. On the far side, Kal could see other creatures that lived on the veldt as they came to drink from the lake, sitting on the opposite edge of the waters to keep distance from Kal and the tribe, who they recognised as their hunters. Gradually, Kal grew to realise that the old one’s body was no longer resting on the edge of the waters. This did not disturb Kal, as in those days, time was reckoned differently than it is now, and what had happened on the last day was as distant as a hundred years hence. Even so, the memory of having left the old one by the lakeshore dwindled lightly in Kal’s mind, with a sense of similarity that was familiar to him. Just as he had left his sharp stone by the pelt he slept under when he slept that night, he had left the old one here, by the side of the lake. The bank of the lake was edged with a material that was wet and muddy beneath Kal’s toes, and if the hunter were to dig down far enough, he would be able to find handfuls of clay. The muddy banks often dried in the sunnier seasons, leaving the ground cracked and brown. As Kal wandered from the rest of his tribe so that he could look around the area where he had left the old one, he found a large number of footprints in the mud of the bank. Kal was a hunter, and as such he recognised that when he was tracking a gazelle, the marks they left on the ground could show the direction that his prey had travelled. Kal knew his own footprints, wet as they were in the mud, and he recognised that these other footprints in the mud were not his own. The tribe rarely travelled so far along the lakeside, preferring to stay near the trail that lead back up to the caves. A sense of uncertainty stirred within Kal, a feeling he had rarely experienced, and he felt that it tasted bitter to him. Circling around the footprints, Kal tried to determine how many of the footprints there were. This was always difficult to do, and it was a great skill of a hunter to recognise the difference between ‘few’ and ‘many’, as many prey could be dangerous even to a group of hunters armed with the sharpest of stones. But Kal could not tell how many had walked here where the old one had been laid, because the footsteps trampled over one another. A realisation gripped Kal in that moment, causing the faint little hairs on his arms and neck to bristle. The footprints were not those of his tribe, for they did not venture out this far. Indeed, as he looked back, he noticed that many of his tribe were making their way back up along the shale trek to prepare for the day’s hunt, with only him remaining. He crouched down on his haunches and tried to see more of the footprints, realising that they were not the tracks of a gazelle, or even a large cat with their sharp teeth that stalk through the night. It looked almost like his own footprints, with five toes and heel strong in the mud, but not quite the same. Kal wanted to track them, to find who had come so close to the lake. He wanted to protect the caves where his people slept, the lakes in which they drank. Kal knew that his tribe was not alone on the veldt, that other tribes lived elsewhere across the Great Plains. They had their own water, their own creatures to hunt for food, and in those days they had not yet had any need to fight over space. Kal remembered a time, many summers ago, when another tribe had travelled far to claim the caves as their own and the women folk as their breeding stock, and been fought off by the tribe’s strongest warriors. Now Kal was the strongest warrior, and so he was the best to fight any others who came to claim the caves or the lake or the women folk. 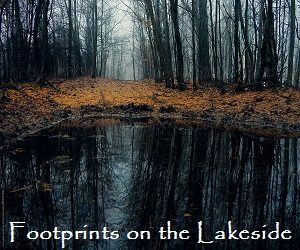 Following in a series of long, circling steps, Kal moved around the footsteps on the lakeside to track where the strange others had come from and where they had gone. If they were close, Kal could move the others to attack first, before the strange others had the chance. Kal would claim their food and add their women folk to the tribe. The footsteps did not move away from the lake. In fact, they seemed to originate from the water, loop and stagger back and forth around the ground where the old one had been laid down, and then descend back into the lake’s silvery surface. It was a good, strong gazelle, and it had given a strong hunt. Kal had brought it down during the day, when the sun had been at its highest. He and three other hunters had tracked the young gazelles across the fields distant from the lake, pursuing them eagerly. The taste of meat was a significant temptation, rarer as it was than the taste of berries which the hunting party would usually bring back to the caves. The gazelles had been grazing when the hunters had sprung, moving close by keeping downwind of the prey. By the time that the gazelle had become aware of the hunters, it had been too late. The group had broken into the herd and brought down two of the younger bucks, piercing their flanks with their sharpened sticks, cutting at their legs and throats with their stones. Two young bucks would feed the tribe for the next couple of days, but Kal broke from the party and sprang eagerly to bring down a third gazelle, a fully-grown adult male. The decision to do so was not unnoticed among the other hunters, as one of the others turned and gave an angered cry at Kal. It was a foolish decision, as the male gazelle could lash out with a kick strong enough to break a bone, and Kal was fortunate not to fall victim to this. Instead he managed to grapple atop the creature, driving the sharpened edge of his stone into the gazelle’s skull again and again, driving it twitching down to the ground. Kal leapt to his feet, barking loudly at Tak. Clutching his own sharp stone in his hand, he lunged a step towards the other male. Tak hurried back a step, and both males looked coldly at each other. Kal waited, watching to see what Tak would do. Gradually, Tak stepped back. Kal watched the other male lope steadily back to the group. The gazelle had to be carried between two of the hunters, which slowed their time in getting back to the caves to a slow trek, and by the time they got home the sun was already starting to descend in the sky. The tribe gorged on the meat that night, enjoying the freshness of the food and the strength it brought to their bodies. But with the wealth of gazelle that the hunters had brought back, the tribe were too gorged to devour the bulk of the adult male. As the sun dipped beneath the crimson horizon and the stars began to fill the sky, Kal dragged the half-eaten bulk of the gazelle down from the mouths of the caves. He pulled it along the shale path that lead down, tugging it in weary jerks until he finally arrived at the side of the lake’s pitch-black surface. The pelt wrapped around Kal’s shoulders kept the cold bite of the night at bay. He sat at the mouth of the cave, clutching his sharp stone to his chest, watching the black lake. The lake had been there since Kal was a mere child, since before he could remember. It had always been there; it was a constant. Always there, sitting in silence, just beyond his doorstep. Kal did not look up, did not gaze into the starlit sky as his descendants would. He gave no thought to the large pale moon that hung high above him, bathing the veldt in the light he needed to see in the night’s darkness. In the untold years and ages to come, Kal’s children’s children would look up into the sky. But for now, Kal looked down, into the black waters of the lake, impossibly deep, unfathomably empty, and unknowably infinite. He had kept his stone tight, running his fingers along it. It had, over many summers of use, been perfected. It was carved to a point on one side, with one corner of that point being sharp, sharp enough to cut through the skin of the gazelle. Or, he hoped, the leather of the strange others who intruded into his tribe’s home. If Kal had possessed much in the way of memory, he would have thought about the stone that he held. He had used it many times to bring down the larger creatures, so that he could bring food back to the caves. He had chased some from the mouths of the caves when things in the night had come to claim his people as food of their own. And once, some summers ago, Kal had almost turned the stone on one of his fellow cave-dwellers who had grown jealous of the female that Kal had chosen to mate with, and wanted to claim the female for his own. The cave-dwellers existed only in the present, barely able to recall the past or look towards the future; but in the dim recesses of his mind, Kal could still recognise the face of the jealous challenger every time he looked upon Tak. Kal struggled to resist the urge to sleep; the chill of the night forced him to pull the pelts around him closer. He had not even recognised that he had been laying a trap for the strange others, with their weird footprints so indistinctly different from his own, slightly more broad, toes slightly longer. When the urge of sleep started to tug its hardest at Kal and he found his shoulders slouching, his eyelids closing and his grip on his stone loosening, it was the sound of the movement of the lake’s surface that brought Kal sharply to attention. Reflecting in the moon’s light, the black surface of the lake shimmered with silvery ripples. Kal’s eyes snapped open, and he lowered himself closer to the floor of the cave. As he watched, the ripples started to spread outwards, sending wide circles across the water. Gradually, the source of the ripples began to move, working their way closer towards the shore. The young hunter started to make his way towards the shale path, keeping his body as low to the ground as he could, ready to catch the strange others unaware. The surface of the lake broke as the beings’ heads emerged from the dark waters into the moonlit night. The moonlight reflected against the damp surface of their flesh, vibrant against the liquid’s eternally bleak shade. The figures emerged slowly, their heads turning to survey the lakeside – yes, Kal was sure; there were three of the beings. What hair they had was long and coated flat to the curves of their skulls in thick rope-like strands. Their features were sharp, as precise as the razor-edged stone that Kal clutched frantically in his fist. Their noses were short and close to their faces, but narrow and looking almost straight, as were their brows. Where on Kal’s head sat his ears, the creatures had nothing but smooth skin, concealed by wet tangles of hair. Their bodies were tall, taller than Kal or any in the tribe, and as thin and precise as their features; their arms were long, as were their legs, elongated and pointed in jointed elbows. Their hands, like the feet that made the footprints upon the mud of the lakeside, were broad, flat and long. They wore nothing but the water’s glistening reflection of the moon’s light on their bodies, and as they moved they stepped in uncertain, slouching steps, as if unfamiliar with the very ground beneath their feet. More than anything else, though, Kal could not help but notice the shade of their skin, which seemed unlike any colour he had seen at once before. It seemed as dark as the lake at night and as blue as the waters at midday, as orange as the sky at sundown, and as silver as the light from the moon, all at the same time. The three beings canted their heads to one another, as if in communication, turning their gaze from one another to the lump of gazelle on the lakeside. They stood for a while there, as though reaching a decision, when Kal finally tried to move closer, his foot sifting quietly against the shale. One of the creatures turned and looked directly at Kal. The young hunter stopped where he was. He looked back at the creature, as its two companions turned to view the young man from the cave, dressed in his furs. And that was when Kal saw the one thing that he would remember for the rest of his days. The creatures had the most beautiful eyes. The next day would dawn, and Kal would still think of the creatures with the beautiful eyes. He would remember them dragging the gazelle back down from the lakeside, with their long, thin fingers. He would remember the creatures sliding into the lake’s infinite, unknowable embrace with the ease of a child nestling against their mother’s breast. He would remember checking the ground where the creatures had come ashore, and finding only their peculiar footprints at the lakeside. But more than anything else, he would remember that they had the most beautiful eyes. And so it was that on the next day, Kal brought down another gazelle, and left it on the banks of the lake for the creatures to claim. He did so on the third day as well, hoping that the creatures would accept what he brought to them. That night however, as Kal sat near-slumbering at the mouth of the cave, he noticed another figure skulking its way along the lakeside. It wasn’t until he was halfway down the shale path that Kal recognised the figure as Tak. The other male stood in the moonlight, towering above the dead gazelle at the side of the lake. Keeping low against the shale, Kal watched as Tak, who so many months ago had challenged Kal for the female to mate with, and challenged him only a few days ago on his rights to hunt, stood ready to challenge those unknown things that accepted Kal’s offerings at the lakeside. Tak stood fully upright, his body painted in the silver light of the moon. He wore no furs to slow his movement, he was here to fight. He slammed the stone he held against the offered gazelle, and with a sturdy kick he sent the body trailing in the dust, rolling away from the corner of the lake. He turned to Kal and bellowed, mockingly. ‘See what I have done to you and your lake friends’, he seemed to say. ‘You are unfit to lead. The tribe is mine’. Anger bubbled inside Kal. The other male was not simply challenging him – that was something he could have easily resolved in a fight. Instead he felt as if something far more important was being threatened; something intangible and unspeakable, as if the creatures with the beautiful eyes would have grown enraged with Tak as well. He had insulted them, and that made Kal’s rage churn and seethe inside him. He ran forward, and made to strike the arrogant male who stood in defiance not just to Kal, but to the unknowable things that lurked within the infinite depths of the abyssal lake. His strike knocked Tak backwards, causing him to stumble. He hit Tak again and again, Kal’s sharp stone growing wet and slippery as it drew wounds into Tak’s body. In the moonlight, the cuts leaked with the same shade of liquid as the lake itself. Tak’s feet gave out beneath him, and he fell into the waters, snarling all the meanwhile at Kal. And it was there that the creatures seized him. The hands, thin and elongated, burst from the surface of the water and wrapped around Tak’s legs. Another pair grasped his shoulders, and their glistening claws scraped along his skin. Tak struggled, desperately. He tried to pull himself back up, urging himself back to land, searching for it frantically with his hands like a blind man. Within only a few seconds, Tak slipped beneath the surface of the water. His face remained, wet and shining in the moonlight above the black eternity of the lake, before the creatures with beautiful eyes took that down into the depths with them as well. The creatures feasted well that night, and for all the nights after. In the days that followed, Kal would set aside a part of each hunt. Each evening, when the rest of the tribe were asleep, he would bring the gazelle, some days it would be antelope, or if the tribe had hunted especially well, even part of a buffalo. When the tribe did not have such good fortune in their hunts, he would bring berries, or fruits. Each morning, Kal would return to find that what he had left was gone. And when one of the tribe would die, he would take their body to the side of the lake, from where the person had drunk the waters all their life, and return the next day to find that the body had returned into the embrace of the lake. In time, Kal would teach his own children to do the same, and they would in turn teach their children. Kal, and none of his descendants, would understand what an offering was; such concepts were foreign to them and would continue to be so for many ages. And when Kal was an old man, he knew that he too would be brought down to the lake by his children. For all the rest of his days until then, though, Kal never again saw the creatures with beautiful eyes. But each morning, he would see their footprints on the lakeside.